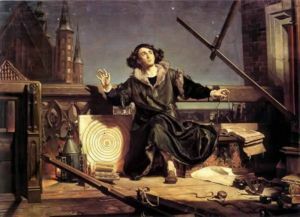 Nicolaus Copernicus (Polish: Mikołaj Kopernik; Born::February 19, 1473 – Died::May 24, 1543) is considered the founder of modern astronomy, who once referred to the cosmos as "built for us by the Best and Most Orderly Workman of all." He was born in Poland and did undergraduate studies at the University of Cracow where he first became interested in astronomy, which at the time was in the field of mathematics. He called astronomy the "most beautiful and most worth knowing." He later obtained a degree in Canon Law at the University of Bologna in Italy while he also continued to study mathematics and astronomy. Here he met scholars who challenged Aristotle's geocentric cosmology. While at the University of Bologna, he was officially installed as a Catholic canon (ecclesiastical administrator) on October, 20 1497. In 1500 Copernicus visited Rome, as all Christians were strongly encouraged to do to celebrate the great jubilee, and he stayed there for a year lecturing to scholars on mathematics and astronomy. Copernicus was later granted leave from his duties as a canon to return to Italy to study medicine at the University of Padua. Afterwards he decided to complete his Doctorate of Canon Law, but rather than return to Bologna he took the degree from the University of Ferrara. 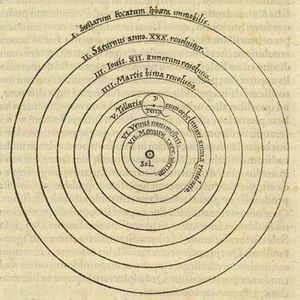 Diagram of the Copernican system, from De Revolutionibus Orbium Coelestium ("On the Revolutions of the Celestial Orbs"), published in Nuremberg in 1543. His views on astronomy were in stark contrast to those of the period, which held that the earth was at the center of the universe (geocentrism). 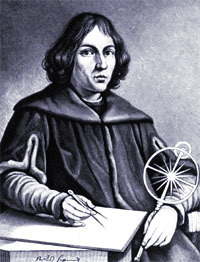 Around 1514 he distributed a little hand written book to a few of his friends called Commentariolus (usually called the Little Commentary), which set out Copernicus's theory of a universe with the sun at its center (heliocentric). "Astronomer Copernicus: Conversation with God" painted by Jan Matejko (1872). In 1514, Copernicus began working on his major work, De Revolutionibus, which asserted that the earth rotated on its axis once daily and traveled around the sun once each year. Copernicus was not the first to make this proposal, but his book gave the concept strong mathematical support. His book was slow to reach the state where he wished to see it published, which ultimately did not occur until the year of his death. The Copernican model was later reinforced by Galileo Galilei, and Johannes Kepler. Despite the controversial nature of his view, Copernicus was able to maintain his position as a canon and served his church faithfully for 40 years, but never pursued ordination for the priesthood. This page was last modified on 4 June 2010, at 19:20.